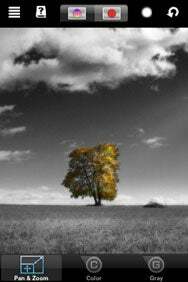 Selective desaturation—converting a photo to black-and-white while leaving the color of one part of the photo untouched—can really draw attention to a photograph. Hendrik Kueck’s ColorSplash brings that image-editing capability to the iPhone and iPod touch with eye-catching results. A Little Splash of Color: ColorSplash turns your images black-and-white, allowing you to restore color to selected areas with the brush of a finger. Three buttons along the bottom let you switch between different modes—Color, which lets you use your finger as a brush to restore color to areas of the image; Gray, which behaves in the opposite manner so that you can fix any areas you’ve overshot with your coloring; and Pan & Zoom, which allows you to adjust the zoom level and position of your image without accidentally altering it in any way. The top of the screen features buttons for selecting the brush type and undoing all your steps up to the first stroke, along with a menu button for saving and loading images. ColorSplash gives you the option of choosing between two view modes at the top of the screen—one that shows the image as it is and another that overlays the colored areas of the screen with a red mask, making it easier for you to make finer modifications and ensure that there are no rough edges. The application hides the status bar as well to give you maximum possible screen real estate. While that constitutes the basics of the interface, there are some other nice touches in ColorSplash that make the task of editing easier. Whenever you put two fingers on the screen, the app goes into Pan & Zoom mode—you can then move your fingers together to pan around or pinch-and-expand them to zoom into the image and vice versa. Turning the phone sideways triggers the app’s landscape mode, which is better suited for certain images. Tapping the screen with a single finger gets rid of the toolbars at the top and bottom of the screen, giving you the entire 320-by-480-pixel screen on which to work. While you can adjust the app’s setting to change the brush size, make the brush tip visible, and toggle the landscape mode on and off among other changes, the developer suggests that you leave the brush size at the default setting and not turn on the option to change the brush size from within the application. Since ColorSplash allows you to zoom into the image right up to the pixel level, it’s better to zoom in to make finer adjustments instead of making the brush size smaller. And that’s good advice—I’ve found that it’s impossible to see the changes the brush tip is making at the smaller sizes because they’re covered by your large fingertip. Once you’re done fiddling with an image, you can hit the Menu button and save it to your Camera roll and then sync it to the photo library on your computer. ColorSplash automatically saves your sessions so that you do not lose any changes if a call comes in or you quit the application. In my testing, ColorSplash never crashed or posed any other problems. The app has one major flaw, though—it considerably downgrades the quality of the edited image in comparison to the original one, which means that the final result can only realistically be used for displaying on a screen. When I edited a 2.4MB 3,363-by-2,402 image, for example, the final result ended up being only 199KB in size and 1,023-by-731 in resolution—certainly not something you can get a decent print out of. That said, ColorSplash is still a great application, putting Photoshop-style capabilities in your pocket. ColorSplash is compatible with any iPhone or iPod touch running the iPhone 2.x software update.